MSE Creative Consulting Blog: What Does "Diversity" Really Mean? 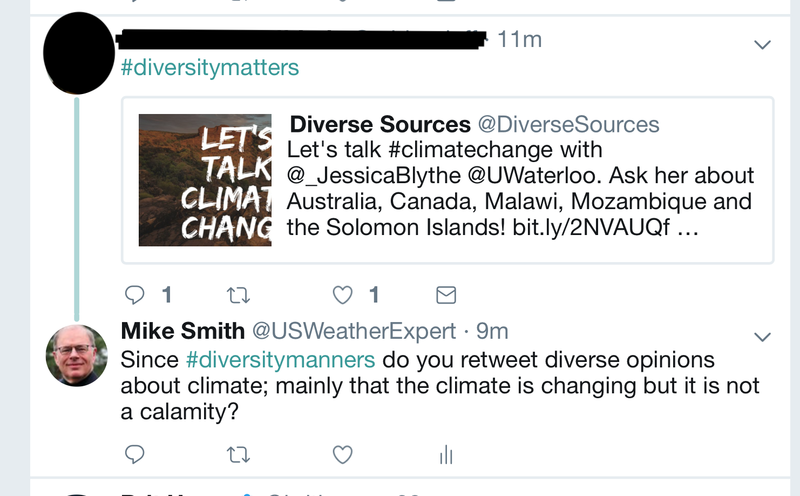 Last week, there was a climate post last week with "#diversitymatters" at the top. So, I asked the author, since she values diversity, if she would retweet diverse climate material. As I specified in this case, it would be an item that agreed the climate was changing but that the results would not be catastrophic. She did not bother to reply. Differing elements. In the realm of climate, it means the wide variety of scientific evidence on the topic of climate change. In other words, diversity = tolerance of people/opinions that differ from yours. True diversity is increasing rare in when it comes to climate discussions.